To cover each Toblerone you will need two border strips approx 3/4" wide x 4" long (2cm wide x 10cm long) & a piece of DSP 4" x 6" (10cm x 15cm). Adhere the border strips to the reverse side of your DSP. Then you simply wrap each Toblerone in its cover, securing with sticky strip. 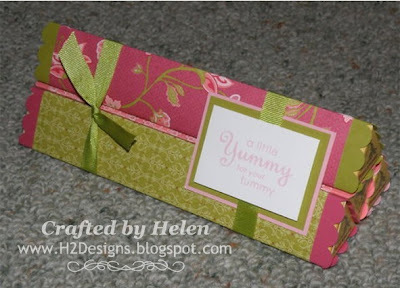 Stack your Toblerones & secure with ribbon, add a sentiment panel & your stack is ready to give.